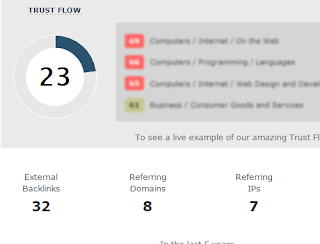 Do you still consider trust flow as a ranking signal in your SEO efforts? Do you think that having a high trust flow would make you really trustful in the google's eyes? And you are still working hard to increase your site's trust flow. Ok, If you are doing all these than stop here right now. Because below you will be seeing a live example that will reduce your SEO efforts of increasing a trust flow for your website or blogger blog. High trust flow does not mean your site will rank high in search engine results. I don't believe in theories that what is a good SEO or bad seo. I believe in implementing and seeing the results. I made high quality backlinks for one of my friend's blog post. He wanted that his blog post should have trust flow higher than 20. Well it was quite exciting for me also because i my self wanted to see the results. Because i also believed that high trust flow means higher ranking in search engine results. So i started working for that. I used mixed anchor text not the single one. I shared the post on social media sharing websites. Published on Web 2.0 sites that already had high trust flow. Submitted on few bookmarking sites. Commented on few related sites. 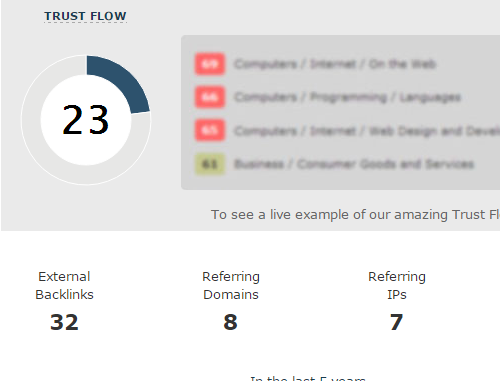 And the result was that post got the trust flow of 23 in just 7 days. Now i thought the rank would have been ranking higher in search engine results. Because the trust flow was higher than trust flow of google's first top 100 search results. But the results were shocking. Still i don;t know why it did not work. I checked manually the trust flow of all other search engine results that were ranking higher than my friend's post. Still I am waiting that search engine position of that post would climb up. But one thing is sure that having a high trust flow does not ever mean that your search engine position would improve. What's your thought on this topic. Please do comment. Description : You think that if your site has high trust flow than it will rank in google search results than you are wrong. Here is the proof.